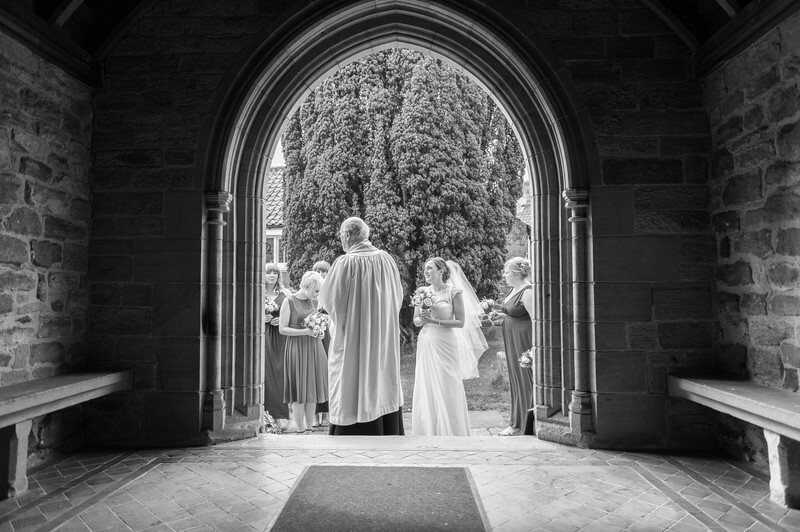 This is an image form the start of a wedding service at the beautiful St. Mary's church in the tiny North Yorkshire village of Lastingham. The vicar greets the bride and her father as they arrive at the church for the first wedding there in 20 plus years! The doorway forms a perfect frame for this image with the dark shadows contrasting the bright sunshine of a late May morning, and converting it to monochrome adds to the drama of the overall scene. We were so happy to be asked to photograph this wedding as we have known the family for many years and the bride since she was nine or ten, it was fantastic to see her walk down the isle to meet her new husband. We live in Yorkshire and photograph most of our weddings in the county or the close-by Derbyshire. Yorkshire is the largest county in England and it is a significant distance from our base in the south of the county to the northern most areas, there is also a vast difference in scenery along the way, we are so very lucky to be based where we are, have so many wonderful places around us which all go to give such fantastic backdrops against which to photograph our couples on their wedding days. The parish church in Lastingham, North Yorkshire is one of those wonderful places, a little out of the way but so well worth the time to get there. 1/400; f/2.8; ISO 200; 24.0 mm.